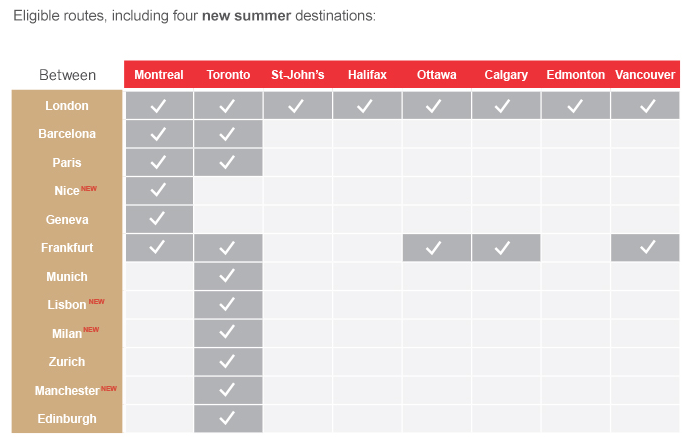 Air Canada and Aeroplan have launched a new route bonus offer for Air Canada flights between Canada and Europe. If you already have tickets to Europe for the promotion period you unfortunately cannot take advantage of the bonus but if you haven't booked yet then you may want to over the 5 or so weeks to be able to earn the bonus. Earn up to 10,000 Bonus Aeroplan Miles when you fly between Canada and Europe on Air Canada or Air Canada Rouge. - Earn 10,000 Bonus Aeroplan Miles, when you have a minimum of 2 one-way flight segments the following eligible fare options (booking classes): Premium rouge/Premium Economy (O, E, N); International Business Class Lowest (C, D, Z, P); International Business Class Flexible (J). Register Online (Registration is required) Register and book between February 18 and April 1, 2014 for travel between April 22 and December 14, 2014. Can't make use of this promotion? Be sure to visit our Aeroplan Bonus Miles page for other flight, hotel, car rental and other mileage bonuses! Are you going to take advantage of this offer? It has quite a large travel window so I would think quite a few of our readers could make use of this offer to pad their Aeroplan accounts with a few more miles!